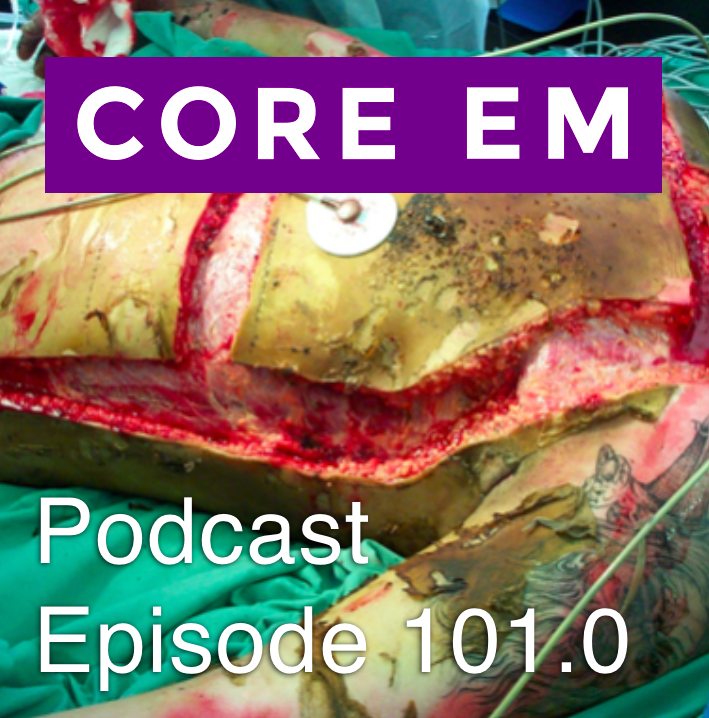 This week we dive into some of the initial considerations in the resuscitation of major burn patients. Be prepared to intubate early, the patency of the airway can decline quickly and without warning. If there is any concern for burns to face/neck or smoke inhalation, consider taking control of the airway early. Review the rule of 9s and the parkland formula to direct your large volume fluid resus. Remember the parkland formula directs you to use 4 mL x %TBSA x weight (kg). Half in the first 8 hours and the second half over the next 16 hours. Given the large volume here it’s probably best to use LR or another balanced solution. And last, consider the need to treat for CO and/or cyanide poisoning. Poor cardiac function, cardiac arrest or a high lactate can be clues to cyanide poisoning and just start 100% O2 while you wait for a co-ox, since CO tox is pretty likely.